A humble, quaint old cottage surrounded by trees and wildlife in the Diocese of Wilcannia-Forbes is now home to a new monastery of cloistered Carmelite nuns from the United States, reports the ACBC Media Blog. The shimmering heat and dust surrounding their cottage is a helpful reminder to the sisters that they are now part of Australia and that they need to pray for the people of the region, who are battling ongoing drought. 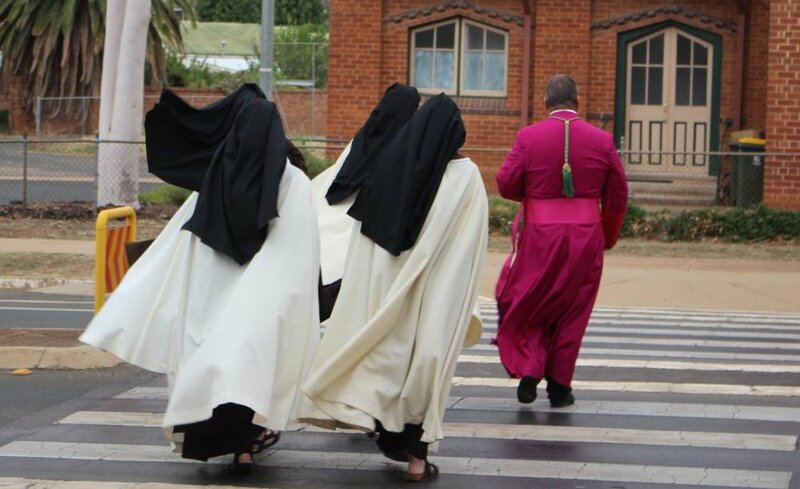 It was a special day on Saturday when the Diocese of Wilcannia-Forbes welcomed back members of the Carmelite order with a Pontifical High Mass attended by nearly 500 people from across Australia. Bishop Columba Macbeth-Green with members of the new Carmelite community in his Diocese of Wilcannia-Forbes, NSW. Georgina Brazier, one of the committee members Bishop Macbeth-Green appointed to help facilitate the nuns’ return to the diocese, said the sisters are “overwhelmed by the lovely welcome that they had from the diocese”. This article was first published on the Australian Catholic Bishops Conference Media Blog.